The blue of the sky is still dark and Ramesh has woken up to the morning alarm. It is an hour earlier than the time designated at the ashram. He finished the assigned chores and walked to a nearby clearing. One could find him, on most mornings, sitting under a Banyan tree by the side of a stream that joined the holy Ganges. Everything was now a routine. But, Ramesh had no memories to build in Rishikesh; only some to confront. 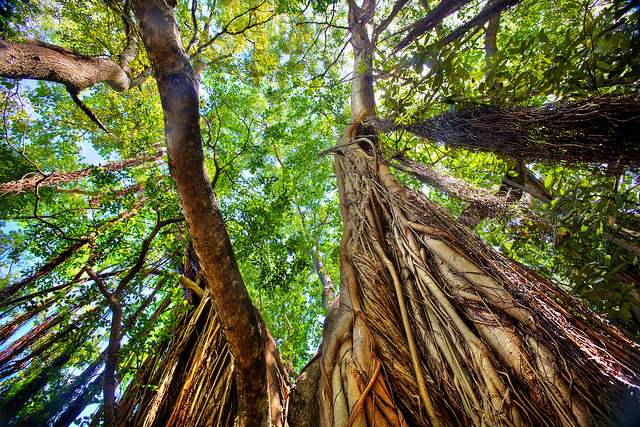 The Banyan tree reminded him of his mother and the stream of the time lost. He felt forgiven and protected under the tree. Ramesh’s thoughts wandered through his entire life, in search marks that were engraved but forgotten. Though those memories deepened his sense of loss, he found it settling. From where he sat, he could see the stream flow peacefully. The stream's ability to accommodate and its calmness were familiar to him. He wanted to go, sit by it, cry and, apologize for what he did. But he needed time to build the courage to do that. It had been years since he left her to fend for her selves; could he still ask Devika forgiveness? The insignificance of the things that he had held so dear, for so long dawned upon him; it was disturbing. Prof. Ramesh Nair remembered, how every night, he prepared for the next day’s lectures. In the beginning it was a desire to learn and, to teach well. Then it turned into a preparation, in defense against any attack on his self-image. He never let anyone question his knowledge or authority. The pride he took when his colleagues saw him with awe and students with reverence was his daily dose of opium. He had worked hard to build his reputation and the institution. He considered himself in line to be the next principal. He knew he had played all the right moves; it was only a matter of time before he got his appointment. Then, one insignificant moment made him question his acquired knowledge, his estranged relationships, his ambitions, his fears and his life. Ramesh hadn't yet discerned what happened that day. It was the last lecture of the academic year. It was a Thursday morning. He entered the lecture hall and walked to the dais. He placed the note book he held in his hand, on the table at the center of the dais and, then turned to face the audience. It was a gathering of around eighty students. It was his last lecture to the batch. They were in their final year. Ramesh was a well-dressed man with extremely good looks for a teacher. He stood tall, dressed in appropriate formals, with his hands on hips, projecting the confidence that he believed, made him what he was. Suddenly, as if his thoughts were swapped by someone else’s, he was in an uncomfortable level of awareness of his reality. He realized he would never again see most of the students whom is knew for 4 years. He knew some would forget him the next hour, most by the end of the day and rest in few days. All would be out into the world where he would cease to be relevant. However, he would continue his struggle to prove to others and thus to himself, his importance. He kept looking at everyone and remained silent for a longtime until gentle murmurs brought him back to the awkward situation he had created for himself. He immediately walked out of the hall. This was all he remembered of that day. He had taken a train to Chennai the next day - one final trip to his present life before leaving it behind forever. Ramesh saw some inmates of the ashram at a distance walking towards the stream. He didn't want to speak to anyone; he didn't want even the slightest of the distraction. There was much for him to converse with himself; some questions to be asked and more to be answered. He touched the ground in obedience and walked back to the ashram. "There is one bit of information that I could give you; which I don’t know if would be of your interest or use,” Professor Patnaik told the police officer. Prof. Patnaik and Ramesh had started their career together and were considered very close. "Prof. Nair had not been feeling very well from quite some time. He was finding it difficult to sleep. I guess, he had been consulting someone", Prof. Patnaik said as he continued answering to the officer's quires. "Did he ever speak to you about his family or relationships?" asked the officer. “Nair was never much emotional about his family; but then, he had always been like that - very controlled about his emotions. But I surely do not believe he would do something like what you, the police, have declared in the press. He was a very strong man of great courage." "A man is re-born every day; someday entirely different from what he was the previous day. So, you would need an uncanny ability to be so sure about what a person would do and what he wouldn't, just because you think that you know him. Thank you for all the information, professor. I want you to call me in case you remember anything more”, the officer added before he rose to say goodbye. "...never. The Ramesh I knew would never do this. None of us ever wanted leave Kumaranellor. More than love for our town it was the fear of the unknown land. But Ramesh, even then, was very ambitious and was determined to be successful. He always had a definite plan. He had then asked me to join him but I lacked the courage,” said Ravindran. He lowered his newspaper to check Lalitha's reaction. His wife had finished her tea and gone to the kitchen. Ravindran placed the paper on chair and walked to her, repeating what he said. Lalitha looked disinterested. "The news is about our Ramesh..."
"Your friends and you were useless even then. Had you been a bit more sensible, we would have lived much better," Lalitha said as she turned on the grinder. The noise from the grinder and the look on Lalitha's face brought back Ravindran to his own reality. Life sometimes seems to expand to the point at which we cannot distinguish ourselves from the other and yet at other times it shrinks to one's own pit. Ramesh and Ravindran grew up together in Kumaranellor, a small village in Kottayam. Those were the good days about which Ravindran always told Lalitha. But now time had leapt forward and with it had changed many equations. He felt for his friend but he was no longer the boy who took pride in their friendship. Thirty two years was long time. Ramesh probably didn't even remember him. "Stop crying Amma. We always knew he would eventually do something like this, didn’t we?" Anand looked towards the door of the room where Devika sat in mourning. She sat there since morning listening to what Anand was saying about his father and her husband, Ramesh. Anand had taken his father's arm chair in the living room. He now hated his father for being a bad husband to his mother. May be this was the only way he could distance himself from the loss and abandonment. "Do you really miss him? Even if you do, I don’t. When has he bothered to come back and check on his wife and son? After one year? Probably he has a family there and went to them. I am fine to live the rest of my life believing what the police said". Anand regretted saying this. He remembered how much Ramesh had loved him. He got up, put on his slippers and went out banging the door behind him. He didn't want to look weak before his mother. A students touring team had just arrived close to the ashram. Ramesh was watering the plants. The students were joyous and carefree. He imagined his colleagues and students who once looked up to him now sympathizing with him. It was difficult for him to assume they would be missing him. He could imagine them going to the cinemas, laughing and forgetting - precisely 'him’. He would now die an unknown death and forgotten. But wasn't that what he wanted - to get away from everything that is known? Controlling the mouth of the hose to water the roots and then the leaves was getting too distracting for him now. Ramesh turned the tap off, wiped his hands on the dhoti and walked back to the stream side. This was his escape within the escape. But how deeper can he go, he thought. His family would have by now moved on, as everyone does with time. It had been 5 years since he had bid them good bye and a year since he had been able to get news about them. His time in the holy town had given him the answers. But now what he needed was the courage to resurrect. That might take some more time and few more walks to the Banyan by the stream. Ahmedabad: Ramesh Nair, a 49 year old professor from Chennai is missing since last Thursday. He had boarded the Navjeevan Express, bound for Ahmedabad. Nair’s family in Chennai last heard of him on the same evening, near Machiriyal Station, when he called them before going to sleep. Next day when the family tried calling him, they found his mobile switched off. On inquiring with his friends in Ahmedabad they found that he had not reached. The police found his entire luggage in the train and none of the passengers in his cabin remembered seeing him after he had gone to sleep. Nair is a senior professor at the Gandhi College of Commerce in Ahmedabad. He had gone home, after a year, to meet his family. The railway police, after initial inquiry had handed over the case to Ahmedabad Police as Nair was working there. The police are suspecting a case of suicide as the circumstances surrounding the case indicate.